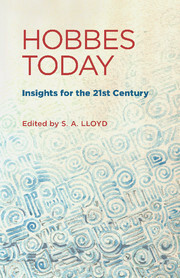 Hobbes Today: Insights for the 21st Century brings together an impressive group of political philosophers, legal theorists and political scientists to investigate the many ways in which the work of Thomas Hobbes, the famed seventeenth-century English philosopher, can illuminate the political and social problems we face today. Its essays demonstrate the contemporary relevance of Hobbes' political thought on such issues as justice, human rights, public reason, international warfare, punishment, fiscal policy and the design of positive law, among others. The volume's contributors include both Hobbes specialists and philosophers bringing their expertise to consideration of Hobbes' texts for the first time. This volume will stimulate renewed interest in Hobbes studies among a new generation of thinkers. Editor's introduction S. A. Lloyd; Part I. Application to Problems of Governmental Powers and their Limits: 1. Supporting a normative order through Hobbesian reasoning Joshua Cohen; 2. A note on Hobbesian lessons on bipartisanship David Braybrooke; 3. Hobbes' theory of rights: a new application Eleanor Curran; 4. Hobbesian legal reasoning and the problem of wicked laws Claire Finkelstein; 5. Hobbesian equality Kinch Hoekstra; 6. The representation of Hobbesian sovereignty: Leviathan as mythology Arash Abizadeh; Part II. Application to Civil Society and Domestic Institutions: 7. On public and private conscience: public reason and religious convictions in Leviathan G. F. Gaus; 8. 'Thrown amongst many': Hobbes on taxation and fiscal policy Neil McArthur; 9. The imperfect legitimacy of punishment Alice Ristroph; 10. In harm's way: Hobbes on the duty to fight for one's country Susanne Sreedhar; 11. Confronting jihad: a defect in the Hobbesian educational strategy Maryam Qudrat; Part III. Application to Problems of Global Scope: 12. Hobbesian realism in international relations: a reappraisal Chris Naticchia; 12. Hobbesian assurance problems and global justice Aaron James; 13. International relations, world government, and the ethics of war: a Hobbesian perspective S. A. Lloyd; 14. Hobbesian defenses of orthodox just war theory Jeff McMahan; 15. Hobbes and human rights Michael Green. S. A. Lloyd is Professor of Philosophy, Law, and Political Science at the University of Southern California. She is the author of Morality in the Philosophy of Thomas Hobbes, Cases in the Law of Nature (Cambridge University Press, 2009) and Ideals as Interests in Hobbes's Leviathan (Cambridge University Press, 1992).